I was recently commissioned to make a special doll for a co-worker. For the last year her and her 10 year old daughter have been reading the Harry Potter books together, and they are about to finish the last one. 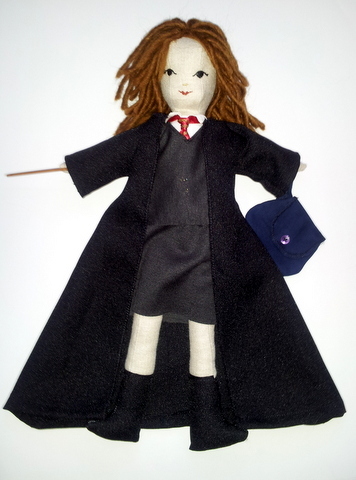 She said her daughter loved Hermoine and asked if I could make her a doll. I meant to take pictures while I worked, but was having so much fun I forgot! The body is made with linen fabric. 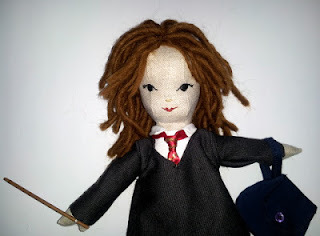 The hair is wool, I used Lambs Pride bulky, because it is a single ply. 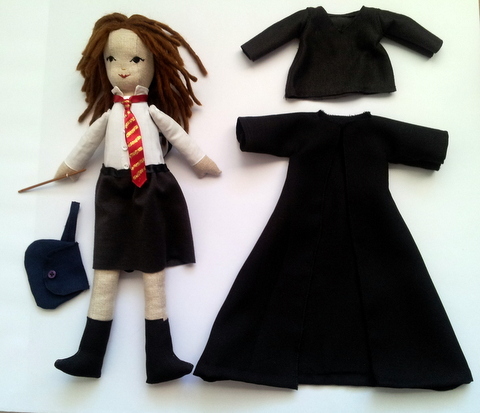 The sweater and skirt are made of a dark grey knit and the cloak is a suiting fabric. The tie is a red ribbon painted with glitter paint. 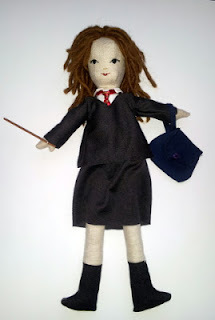 She comes complete with wand and magic bag.